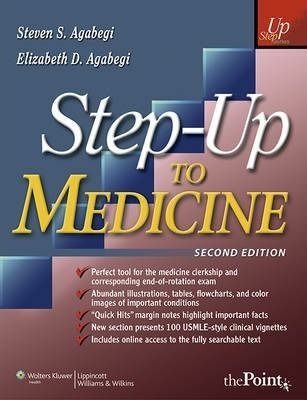 Step-Up To Usmle Step 2 2Nd Ed Pb. This book is a primary review tool to prepare students for both the internal medicine clerkship and the end-rotation NBME shelf examination. This logical alternative to several limited-focus books blends a bullet-outline format students prefer in a review book with comprehensive paragraphs, as needed, for optimal preparation. Illustrations, charts, tables, graphs, mnemonics, and "Quick Hits" pearls for the clerkship speed and supplement learning. Ample content without superfluous detail enables students to readily evaluate and expand their knowledge of cardiology, pulmonary medicine, gastroenterology, hematology, neurology, endocrinology, rheumatology, nephrology, genitourinary disorders, fluids and electrolytes, dermatology, and musculoskeletal problems. A new section in this Second Edition presents 100 USMLE-style clinical vignette-based questions with answers. A color insert contains over thirty full-color images. A companion Website will offer the fully searchable text and color photographs. Publisher: Lw&W Lippincott Williams & Wilkins.